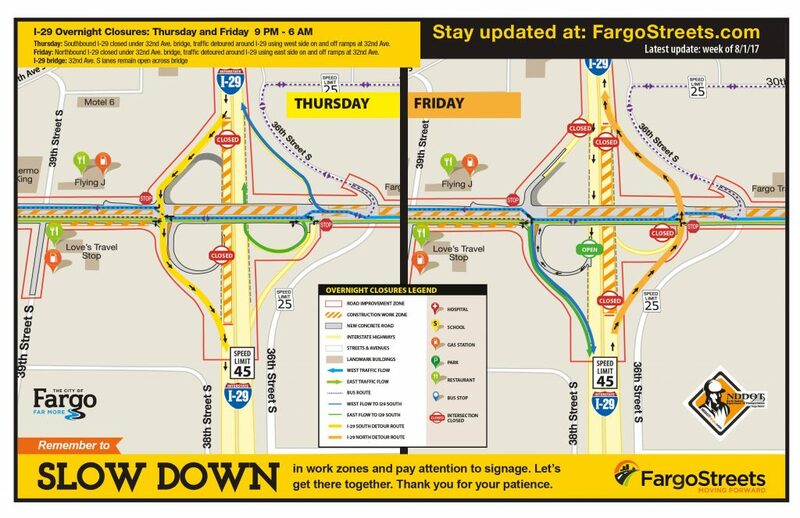 Coming up this week, contractors for the 32nd Avenue Reconstruction Project will be installing beams overnight on Thursday, August 3, and Friday, August 4, to continue with the widening project for the I-29 bridge. To safely complete the work, they must temporarily close each side of the interstate between the hours of 9 p.m. to 6 a.m. During these overnight closures, 32nd Ave. S will remain open for drivers including the lanes over the bridge, where there will be flaggers present to help direct traffic. By the morning rush hour, all interstate lanes should reopen and current work zone traffic patterns will resume. This includes five of the six interstate ramps being open to motorists. This week crews have wrapped up paving operations on a south side intersection. The intersection of 33rd Street S and 32nd Ave S on the east side of the work zone is now open for access to mainline traffic. As a reminder, the speed limit on 32nd Ave. is reduced to 25 mph and 45 mph on I-29. Please be cautious, pay attention to signage and eliminate distractions. Crews are working very close to cones and oncoming traffic in portions of the work zone.